This low carbohydrate recipe is a Low Carb Ham Scramble that is quick, easy, nutritious and delicious. The keys to any diet are "nutritious" and "delicious." The food you eat must delight your taste buds. This low carb breakfast recipe is one you'll enjoy. Ready for Hollandaise! Add it if you like! I often serve this ham scramble with sliced tomatoes and a little cottage cheese (1/2 cup) or fruit. 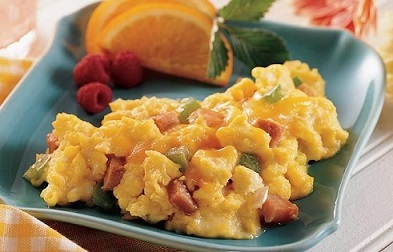 Enjoy your Ham Scramble Recipe and the company of those you share it with! "I take life with a slice of bacon, a slab of ham or a rack of ribs. Life is good!"